You are here: Home / Crochet Other / Link Parties / Link and Share Wednesday Party 200! Link and Share Wednesday Party 200! 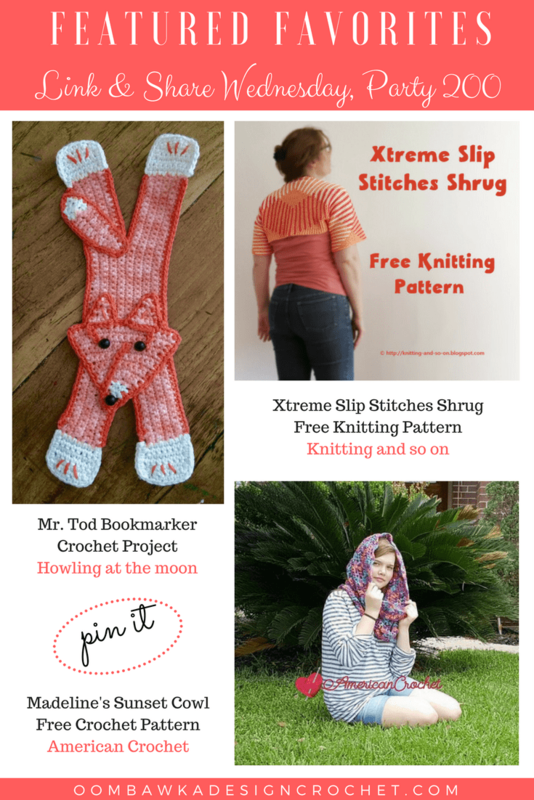 This week on Link and Share Wednesday, Link Party 200, we feature Howling at the Moon, Knitting and So On and American Crochet! The adorable Mr. Tod Bookmarker crocheted by Liz of Howling at the Moon is an inspired by Mr. Tod from the Beatrix Potter’s Books. Liz has included a link to where she found her crocheted bookmarker inspiration in her post. The free knitting pattern for this Xtreme Slip Stitches Shrug from Sybil of Knitting and so on was designed to give the look of a planned pooling project. This free pattern is her 100th on Ravelry. Congratulations Sybil! This 2 skein crochet cowl design is available for free on the American Crochet Blog. Madeline’s Sunset Cowl is lovely and has a bit of extra width making it great to pull up as a hooded piece or wear stacked around the neck. 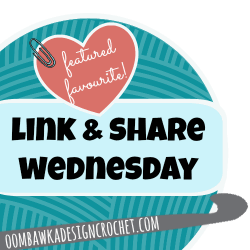 Here are your featured favorites from last week’s Link and Share Wednesday – Link Party 199 as chosen by you! . Howling at the Moon, Knitting and So On and American Crochet! Thank you for featuring Mr Tod, Rhondda!